Laney's an oddball in her small school in rural Colorado--the sort of kid who draws on her sneakers, who's friends with the weird cat lady, who tries her best to stay out of the sights of the class bully. But Laney would be an odd ball anyway--she sees glimpses of the future. Sometimes these "future flashes," as she calls them, are happy...sometimes not. 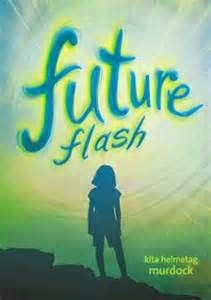 When a new kid, Lyle, comes to town, Laney has the worst future flash of her life. She sees him consumed by fire. Now Laney has to figure out if she can save Lyle from the death she saw...but in the meantime, the class bully is inflicting more immediate pain on him. And Laney doesn't know what to do about that, either. Nor does she know how to figure out the question of who she really is--is Walt, the man she remember finding her as a baby, her real father, and who was her mother? The story is full of tension, as both Laney and the reader move toward the horrible event to come, and Laney is a girl reader can relate to and sympathize with. Or they can readily sypathize wiht Lyle, a geeky kid thrust into a horrible situation--the bullying he recieves is rather awful. And though this isn't a book with tons of nuance, there's enough emotional warmth to go along with Laney's fascinating gift of future flashes to make for a fine read. This is one to give to the kid, I'd say a fifth or sixth grader or thereabouts, who likes brisk realistic fiction (the themes of bullying and wondering about family secrets will be familiar ground) but is ready for a twist--Laney is an ordinary girl, but her fantastical gift is real, and powerful, and shapes her life. On the other hand, the reader who loves Fantasy with a capital F may be a tad disappointed. The flashes of precognition are not part of any larger phenomena, just one aspect of Laney's particular life, so they are more a useful and interesting plot element than the sort of fantastical premise that overwhelms just about everything else.